Are Sea Burials Greener Than Land? A body is prepared for a “full sea burial”. Note iron weights alongside the remains. Following the killing of Al Qaeda leader Usama bin Ladin and his burial at sea, Green Prophet’s Zaufishan asks Can Muslims Be Buried At Sea? The question I am asking is whether the bin Laden’s burial at sea was as “green” compared to other forms of burial on land, including burial rites for Jews and Muslims. Burying at sea was once an unavoidable circumstance of long sea voyages on sailing vessels – where passengers and ship crew succumbed to disease or other circumstances, and there was simply no other option. 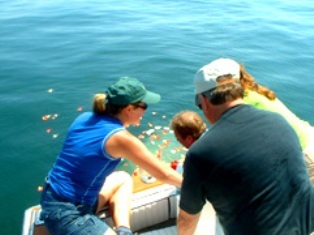 Nowadays, an American company, New England Burials at Sea LLC, offers special charter burial services for bereaved families to either scatter a deceased relative’s ashes over the waters or to bury the whole body into to bosom of the sea. This service is being said to be a very environmentally friendly or “green” way to dispose of a person’s remains. The process, in which the creatures of sea, including various fishes and crustaceans, literally devour the corpse in a fairly short period of time, doesn’t always happen this way, according to Mother Jones. This article reports the success of burying a body in the briny deep depends on how deep the body is “buried” and how it is prepared for the burial: how is it weighted and how easy an access for the creatures of the sea to “dispose” of the remains. Osama bin Ladin’s sea burial, off the deck of the USS Carl Vinson aircraft carrier, was supposedly done according to Islamic Law (Zaufishan’s article on Muslim burial rites reports otherwise), although this type of burial for Muslims is only in extenuating circumstances. 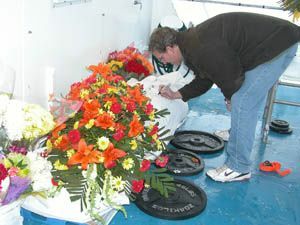 The cost of a sea burial via a service company like New England Burials at Sea is not cheap by any means and can cost in the neighborhood of $9,500 and up, depending of the type of memorial service rendered, how many people are taken out for the service, and how long the boat is at sea. A land based service, on the other hand, according to both Muslim and Jewish traditions, can cost considerably less; and both religions require that a person be buried within 24 hours of death and wrapped in a simple sheet or linen shroud. Embalming, a very non-environmentally friendly practice, is forbidden by both religions. So are burials in bronze or metal coffins as well. As far as burial at sea goes, Brad White, head of New England Burials at Sea, and a retired ship captain, did a lot of research to find out what kind of body bag is best for use as a burial shroud and how long it should take for the sea to do its work on the body it receives. “We would use store-bought roast turkeys, chickens. Animal Control supplied us with road-kill foxes, possums, raccoons. We used a little bit of everything,” he says in the Mother Jones piece. White claims that his company’s method of sea burials is as biodegradable as possible, and that his aim is for “clean oceans”. As for what will happen to Bin Ladin’s remains, White believes that due to the higher temperature of the waters of the Arabian Sea where he was buried, a high number of sharks are attracted there, as noted in previous Green Prophet articles, even though the sharks are being over-fished there in great numbers. Although burial at sea and “green” burials on land can both be environmentally friendly, it’s unlikely that religious groups like Jews and Muslims will be queuing up for sea burials anytime soon. Bin Ladin is Dead. Will the Environment Benefit? Previous Previous post: Can Muslims Be Buried At Sea? For the record, we have had several Jewish burials at sea (Ash scatterings)for reformed Jews and we have also had several “pre need” plans for reformed Jews. Sorry – left a phrase out. I meant: it’s *unlikely* that a big Jewish move towards sea burial will develop. Jewish law permits burial at sea if there is no other way to dispose of a corpse – which Zaurfishan points out is the same in Moslem law. I agree with you, though, that a big Jewish move towards sea burial will develop. Just a note. While it’s understandably disgusting to think of a human becoming a fish’s dinner, in land burial bodies beome “worm’s meat” anyway. Or so Shakespeare put it. I guess the bottom line is: respect the dead and let nature take care of the rest, without us dwelling on it too much.